Overlooking the Normandy D-Day Beaches, between Omaha and Utah, stands a 30′ granite slab with the silhouette of a Halifax bomber carved out of it’s centre and with the large gold letters spelling “Guyenne” and “Tunisie” either side between to the flags of Britain and France. The impressive memorial points towards the North of England and is the twin (albeit much larger) of the memorial which stands at Elvington. They both commemorate the two RAF Elvington, French squadrons, for which this little corner of France was one of their first bombing missions on the night before the invasion of Europe. Every year at ths time, veterans, families and friends meet to pay hommage to the men of these unique and special squadrons. They remember those who took part and especially those who never returned. They celebrate the enduring friendship which their connection with Britain has endured for 70 years and continues to this day through their children and friends. This is Association des Anciens et des Amis des Groupes Lourds (French Heavy Bomber Group Association). 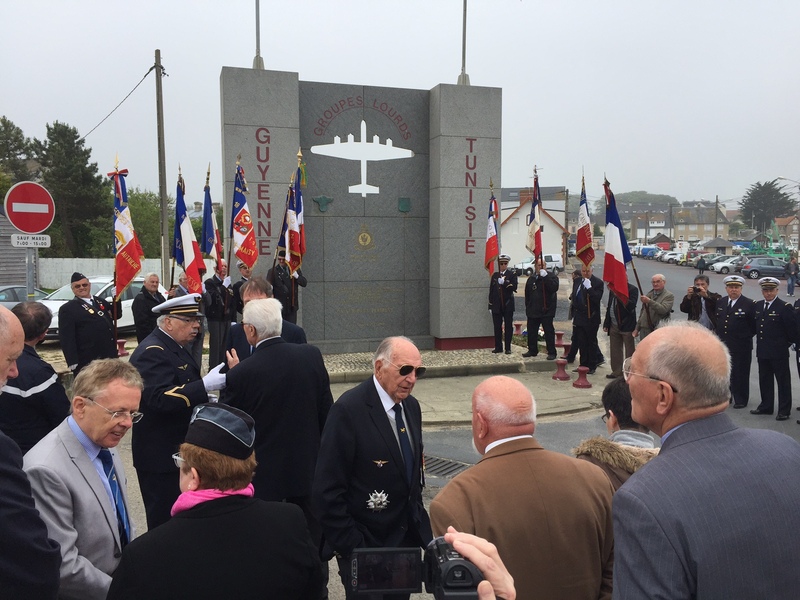 On May 28th the annual commemoration took place beside the sea at Grand Camp Maisey with local civic dignataries; air force and military representatives, families and friends from UK and France. It is preceded by a church service and then down to the beachhead to lay wreaths at the memorial. Grand Camp Maisey is a sleepy little fishing village in the bay between Pointe de Hoc and Pointe de Maisey. The latter only recently being identified as the main German gun implacement which received direct hits by Guyenne Squadron from Elvington on the night of 5th June 1944 and continued in action until June 9th 1944. The British owner of Maisey Battery, Gary Stern, is restoring the previously hidden site, which is vast, and has caused a great deal of controversy because the location of the main US target, Pointe de Hoc, did not in fact have any guns on site during their famous ground attack on June 6th and the main target Maisey Battery was missed for several days. Maisey Battery’s sophisicated radar controlled anti-aircraft guns destroyed very many allied aircraft as they passed over on their return loop from the D-Day beach area until June 9th and its large guns continued to threaten both US beaches for several days. Maisey Battery now has a memorial to Groupes Lourds and a new memorial to the US Rangers is to be installed this year in recognition of the troops who eventually put the base out of action. The beach at Grand Camp Maisey, Normandy looking west towards Pointe de Maisey where the main German gun battery was located and the site of one of 346 Guyenne Squadron’s first targets, on the night of 5/6 June 1944, after they were established at RAF Elvington. Before the ceremony at the Groupes Lourds Memorial, relatives and friends gathered for a Service of Remembrance at the church in Grand Camp Maisey which overlooks the beaches from higher ground. Wreaths were laid at the memorial in the church grounds. Photographs by Catherine Jentaude & Stuart Armstrong.